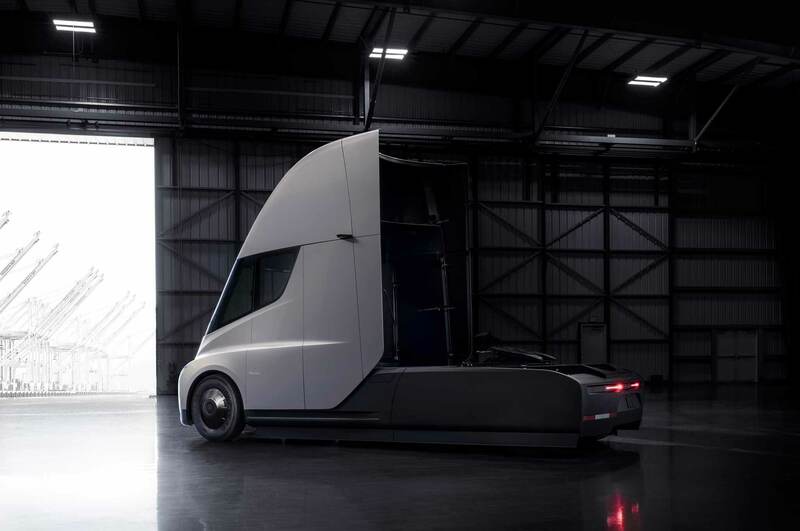 Never before has a semi-truck been as hyped as the electric tractor trailer unveiled Thursday night at Tesla’s design studio in Hawthorne, California. 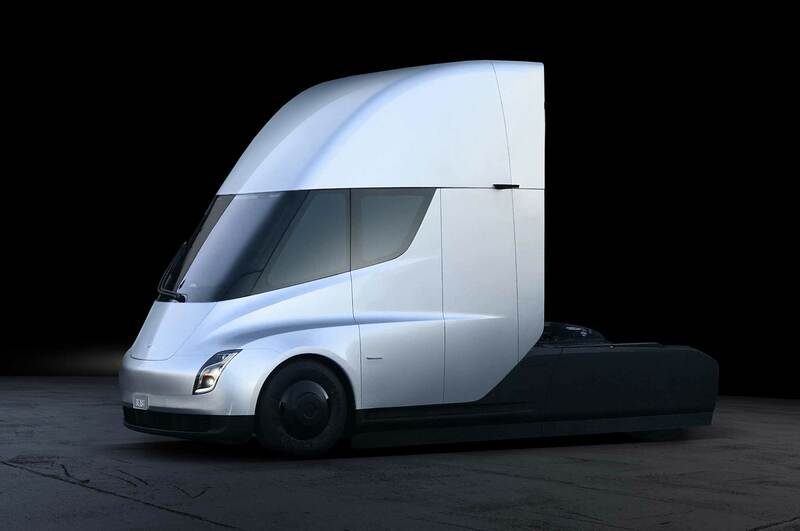 Tesla CEO Elon Musk promised on Twitter that the truck would blow our minds clear out of our skulls. We don’t know if we’d go that far, but the semi’s numbers are very impressive (if true) and its innovative new features could significantly benefit the trucking industry if the vehicle makes it to production. 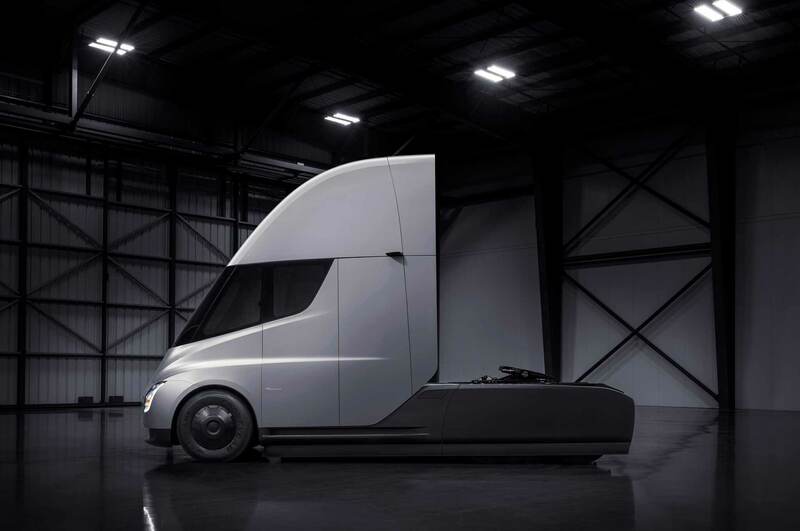 The truck, called simply the Tesla Semi, uses an in-house-designed chassis that integrates the battery packs just like every other modern Tesla product. 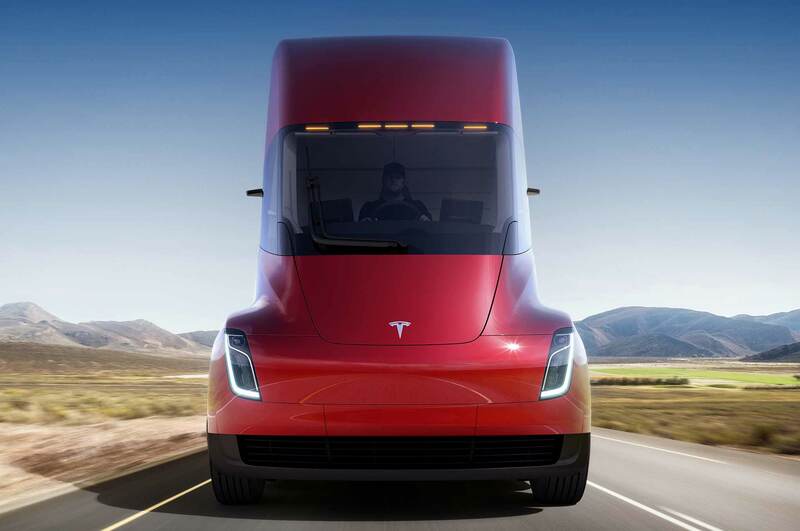 In a walk-around briefing for media ahead of the big presentation, a Tesla representative said the entire truck was designed from the ground up and that safety, efficiency, and driver comfort were all top priorities for engineers and designers. The battery packs are reinforced and sit low in the chassis for a low center of gravity, which is likely part of the reason Musk tweeted that it “feels like a sports car.” Tesla says the battery packs use similar chemistry to other products in its lineup, and that they’re designed for repeated charging cycles. 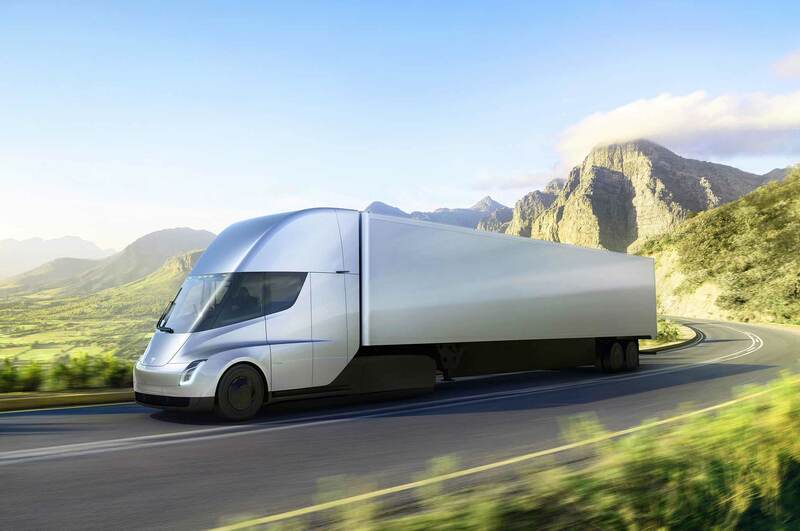 Battery capacity and weight numbers weren’t revealed, but Tesla claims the Semi can go 500 miles on a single charge at max weight traveling 60 mph. Tesla did confirm the truck uses four Model 3 electric motors—one for each rear wheel—and that it can hit 60 mph from a standstill in 5 seconds unloaded, or 20 seconds when towing. Musk said the drivetrain is guaranteed for 1 million miles. 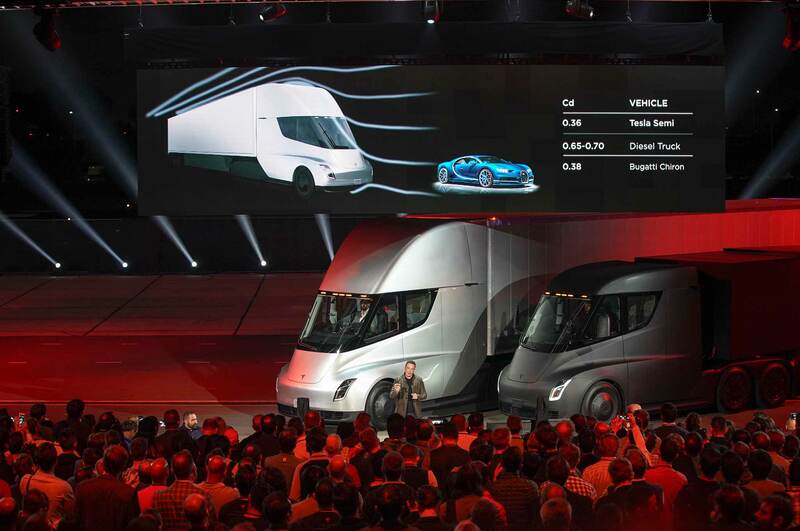 The Tesla Semi falls under the Federal Highway Administration’s class 8 heavy duty category, which is the highest weight rating at 33,001-plus pounds. Tesla says the Semi has a max towing capacity of 80,000 pounds. The fifth wheel, where the trailer attaches, is the largest size available and can accommodate any size trailer. The truck we saw was a day cab, meaning there’s no space for the driver to sleep. A sleeper cab may come later, though, we were told. The bold claims didn’t stop with range or acceleration. 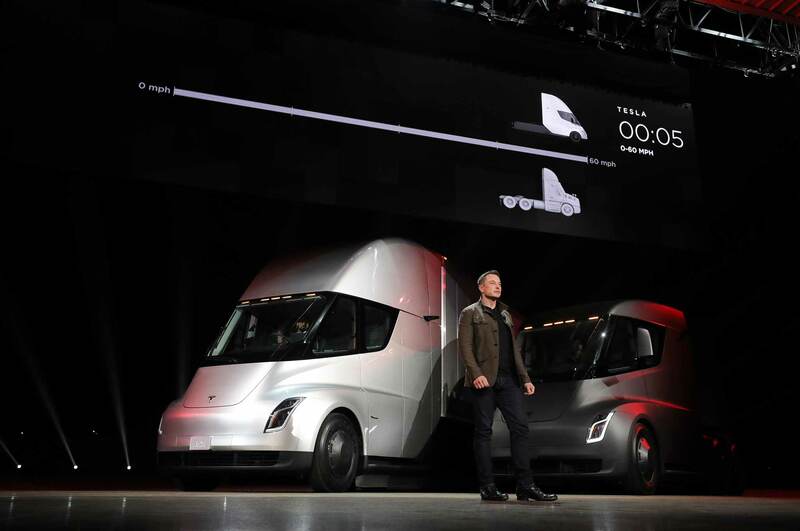 Musk also said the Tesla Semi can regain 400 miles of range from a mere 30-minute charge–the same amount of time the Federal Motor Carrier Safety Administration mandates for a break in an eight-hour shift. Musk says this will be made possible by Megachargers, new high-speed DC charging stations that will be installed “worldwide.” The stations look like Tesla’s existing Superchargers, which already exist on many major corridors around the globe, so perhaps Tesla will simply update its Supercharger network. Musk did say the Megachargers would all be solar-powered, however. Other impressive numbers include the Semi’s coefficient of drag, which Tesla says is a slippery 0.36. 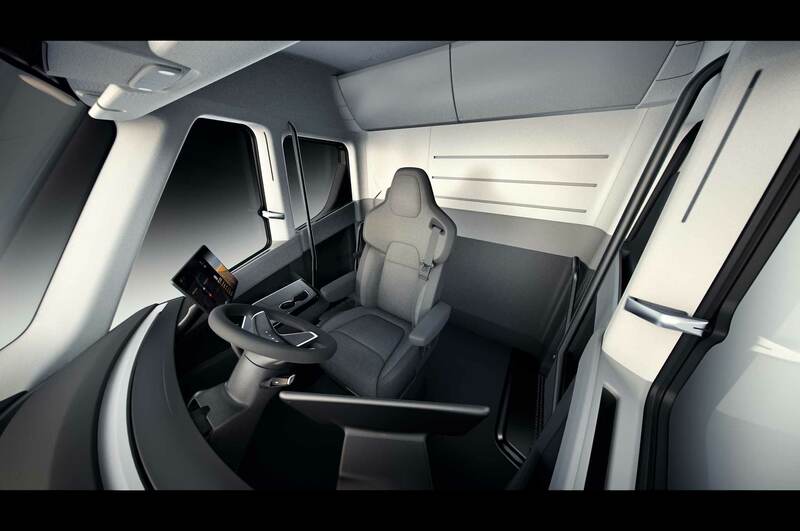 The cab was designed to make the most efficient use of the space, and it certainly does feel spacious compared to current diesel tractor trailers. Because there’s no combustion engine to protrude into the cab, you don’t have the traditional “dog house” center console found in contemporary big rigs. 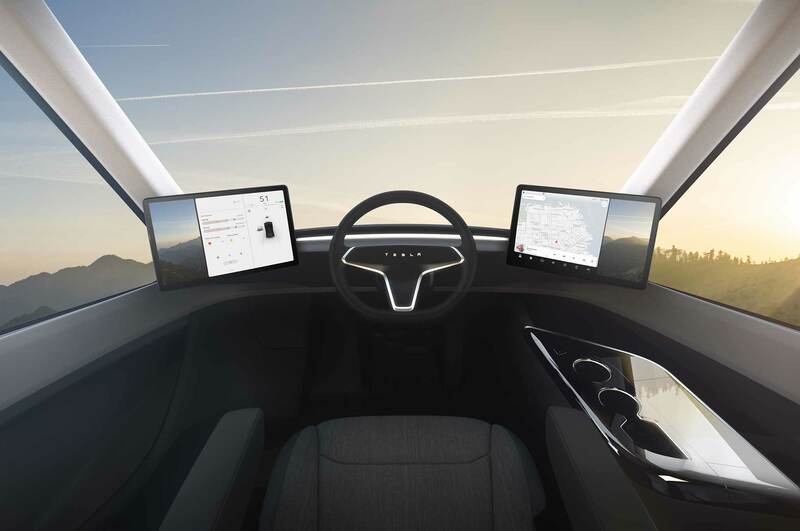 This allows for a single driver seat mounted in the center of the cab that provides better visibility and safety in a crash, according to Tesla. The windshield is made of impact-resistant, “thermonuclear explosion-proof” glass, and the side windows open manually to reduce complexity. 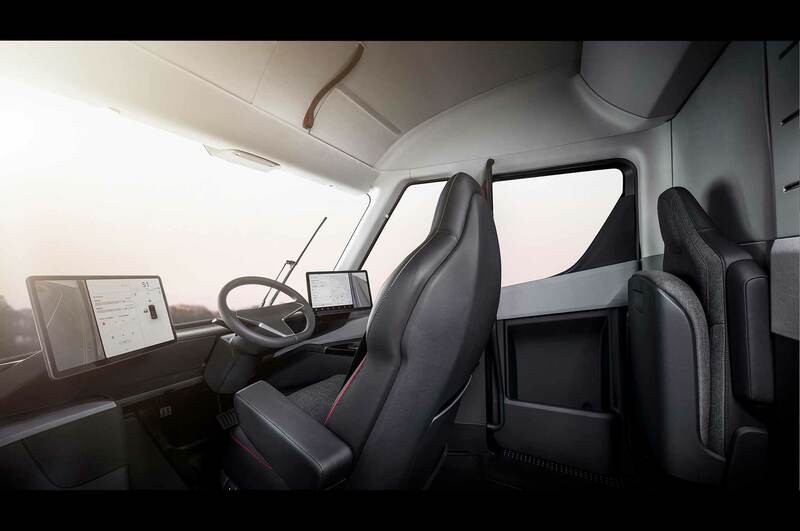 The central seating position combined with the cab-forward design offers a commanding view of the road. Flanking the seat are two large screens borrowed from the Model 3 that display instruments, camera displays, and other info important to truckers. Tesla says its trucks can be directly patched in to a company’s fleet management system, which would in theory cut out the third party that would normally handle routing, scheduling, and monitoring. In case someone needs to ride shotgun, there’s a fold-down jump seat next in back of the cab on what would be the passenger side. Safety was one of the most important considerations for Tesla, and the truck features some interesting tech to help make it safer. Onboard sensors can detect instability and correct it by applying positive or negative torque as needed to each wheel and actuating the brakes. This feature is intended to prevent jackknifing. There are also surround cameras to reduce blind spots that automatically alert the driver to obstacles. 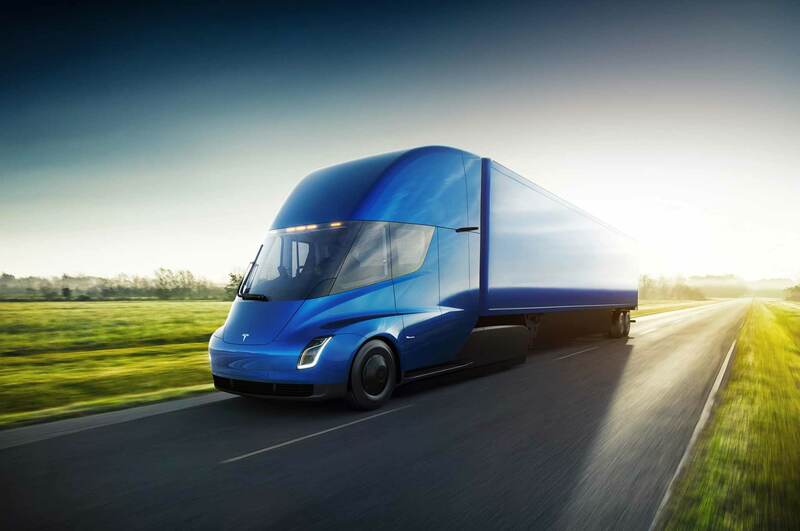 The Semi will come equipped with Tesla’s Enhanced Autopilot semi-autonomous system. The automaker hasn’t given any details on the system’s capabilities except to say it will offer automatic emergency braking, lane keeping, and lane departure warning. Exact hardware is also unknown, though we’re told the system still relies on a combination of cameras, ultrasonic sensors, and radar. Tesla also touts reliability as one of the Semi’s big breakthroughs. Because there are fewer moving parts, there’s less to break down, it contends. That also means less maintenance, which would cut costs for operators. Speaking of operating costs, Tesla came up with an equation to illustrate the savings shipping companies might see. Assuming a 100-mile round trip route at an average speed of 60 mph towing an 80,000-pound load, and also assuming $2.50 per gallon for diesel and 7 cents per kWh for electricity, the Tesla Semi would cost operators an average of $1.26 per mile versus $1.51 for a comparable diesel rig. Tesla says companies can expect to save $200,000 or more per year in fuel costs alone over millions of miles. That’s all according to the automaker’s own math, of course. Musk also claims the Semi will have “basically infinite brake life” thanks to regenerative braking that recovers 98 percent of kinetic energy, so there are more savings there. Tesla’s far from the only automaker working to revolutionize the trucking industry. This past summer, Cummins debuted an all-electric semi with a range of 100 miles (or 300 miles with extra battery packs). China’s BYD and Mercedes-Benz parent company Daimler also have electric semis in the works. Meanwhile, Utah’s Nikola Motor and auto giant Toyota each have a hydrogen fuel cell truck. Toyota’s Project Portal has already begun drayage test runs between the ports of L.A. and Long Beach. Tesla also isn’t the first to work on autonomous systems for heavy-duty trucks. Uber’s Otto, Google’s Waymo, Volvo, and Daimler are all busy trying to automate trucking and eliminate the driver to both reduce costs and decrease the chances for driver error. But if Tesla’s claims are true, then the competition will need to catch up. 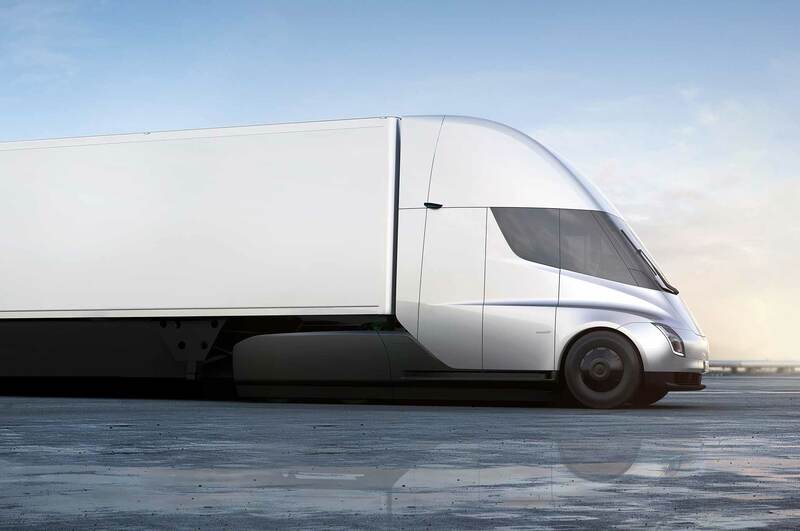 That is, if Tesla can actually mass-produce the Semi. Tesla has faced many setbacks producing its mass-market Model 3 sedan, running into trouble on the assembly line and missing production targets. On top of that, Tesla posted its worst quarterly earnings to date in Q3 of this year, suffering a net loss of $619 million. The automaker says it plans to begin Semi production in 2019, though it didn’t say where. Expect batteries to come from its massive Gigafactory complex in Nevada, however. Pricing has not yet been announced, but you can reserve a Tesla Semi for $5,000. The automaker says it’s already received some reservations. S and X lineups will now start with the 100D models. Hint: They are all made in the U.S.A.